This dataset has been assembled specifically to test color and texture descriptors. It is made public to foster different algorithms comparison. This page will be maintained to keep track of publications using this dataset. Please, report us any interesting result you may have on these images. We analyze renal biopsies and need to quantify the interstitial fibrosis, thus we need to describe jointly the color and texture information. 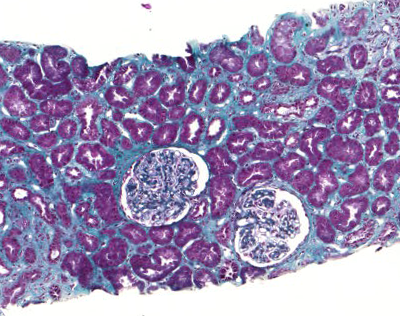 In order to finely segment the images, we need to properly detect the glomeruli structures of the kidney. We used 15 different biopsies, stained using Masson's trichrome, that were collected and processed by different operators at different time in the same hospital. However, all the imaging was done using the same microscope (Zeiss Mirax Scan, 20X objective, NA 0.8) under identical illumination context. We manually segment all the glomeruli and then automatically extract 16x16 pixels non-overlapping square patches. This set has 1976 images of texture, half of which are glomeruli. We thank L.H. Noël from the Necker hospital in Paris for the renal biopsy samples. This project is supported by ATN.